The new Panther 2500 series signal generators delivers industry-best offset phase noise performance, high output power, and fast frequency switching speeds in a single unit. Panther series signal generators are offered in two different configurations designed for bench top and ATE applications covering 100 KHz to 8 GHz, 20 GHz, 26.5 GHz, and 40 GHz with frequency resolution of 0.0001 Hz over the entire band. Loaded with standard performance features such as high time base stability, frequency modulation (FM), high-speed pulse/square wave modulation (PM), amplitude modulation (AM) and high leveled output power makes it an excellent test solution for a wide range of CW, modulation, swept frequency, and fast frequency switching applications in both R&D and manufacturing environment. The 2500 series signal generator utilizes the Giga-tronics new Advanced Synthesizer Technology that delivers excellent close in phase noise performance of -84dBc @ 100 Hz and -104dBc @ 1KHz and ultra low phase noise performance of -111 dBc @ 10 KHz and 100 KHz offset on a 10 GHz carrier frequency. 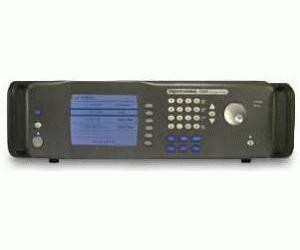 The Panther 2500 series signal generator is a unique blend of performance, reliability and a simple user interface that helps our customers lower their overall cost of ownership by shortening instrument-learning time and reducing systems integration effort through Automation Xpress™ on a system that is backed by four years standard warranty. The Panther 2500 series unit has full command compatibility with 2400 series and previous generation signal generators from Gigatronics. In addition, Giga-tronics offers optional command set for legacy signal generators offered by other manufacturers allowing customers to replace all legacy signal generators with single unit from Giga-tronics.